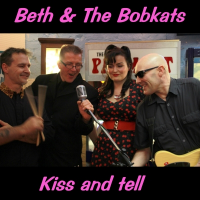 Beth and The Bobkats are a rockabilly outfit from Liverpool, led by guitarist and songwriter Pete Morley, who is a big fan of 'femme vocals'. He is ably assisted by Paul and Ian on bass and drums. Beth adds her own unique vocal stylings to the mix with some covers of Janis Martin, Nancy Sinatra and Gloria Jones. However these guys aren't lost 'in the past'. You'll also find covers of Imelda May and Maibell and The Misfires from Finland. Add to this a couple of inventive instrumentals and we have a very 'playable' album.